Kit Kemp in a hotel room of her design, May 2016. 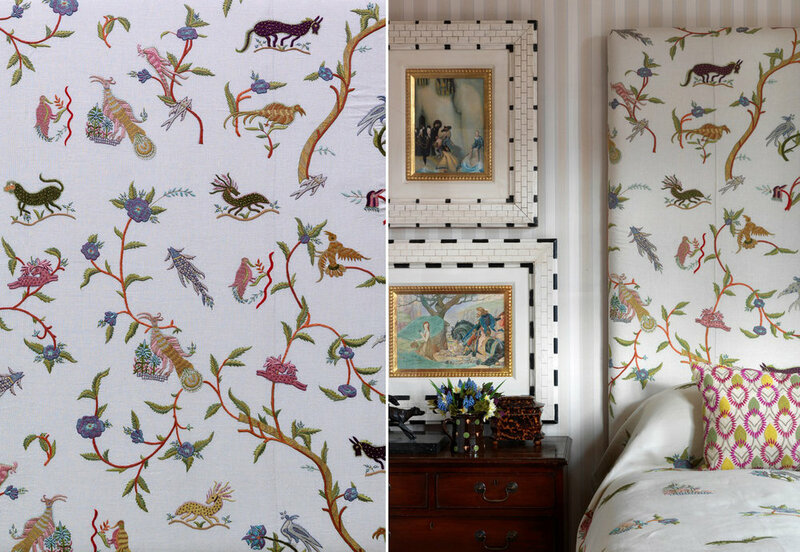 Kit Kemp is a self-taught, award-winning interior designer, perhaps best known most recently for the luxury hotel group that she owns with her husband, Firmdale. Her lively, unique style is no doubt the key to the success of this venture, which has hotels in London and New York. Many esteemed companies have collaborated with Kemp on original collections, including Anthropologie and British rug designer Christopher Farr. 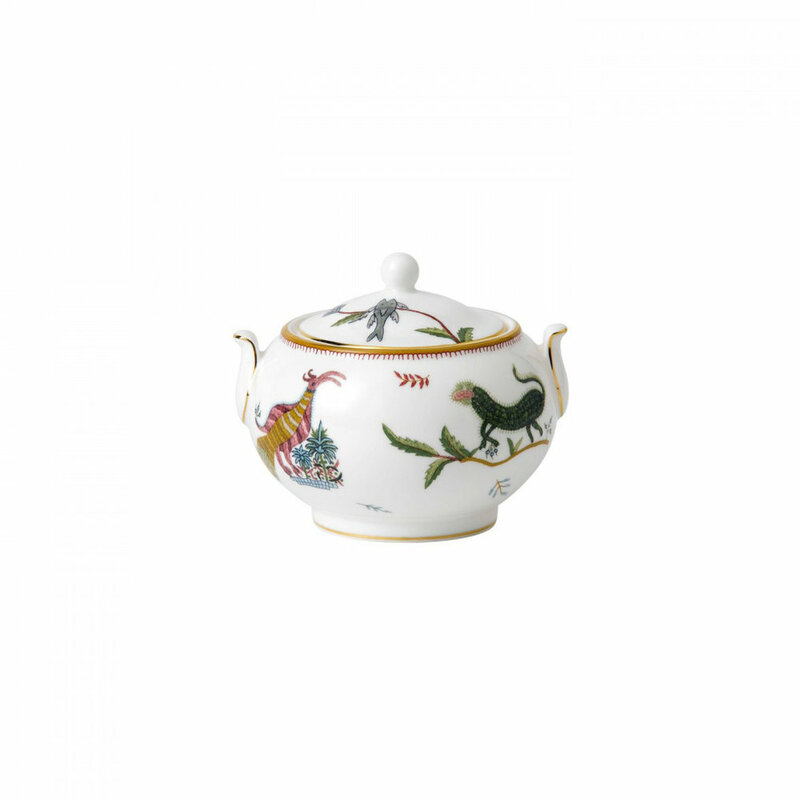 Of these artistic forays, the resulting collections that excite me most are the two resulting from her 'Mythical Creatures' designs, which were first translated into a hand embroidered fabric with the fabulous Chelsea Textiles, then prompted further exploration with a full collection of china from historic British table and homeware company, Wedgwood, famously a favorite of English royalty. 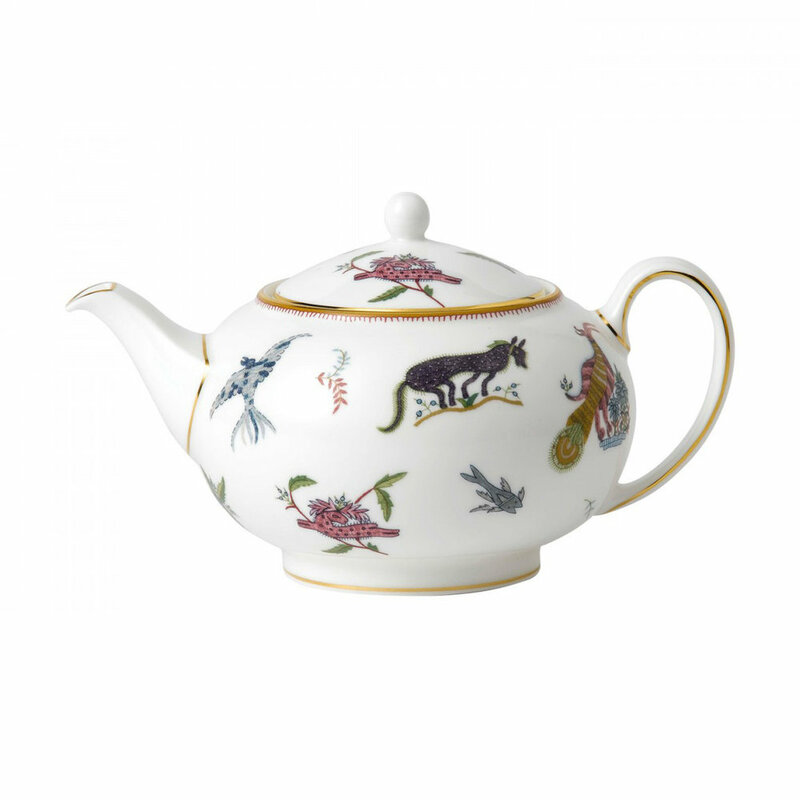 A tea setting using Kemp's Mythical Creatures collection for Wedgwood. 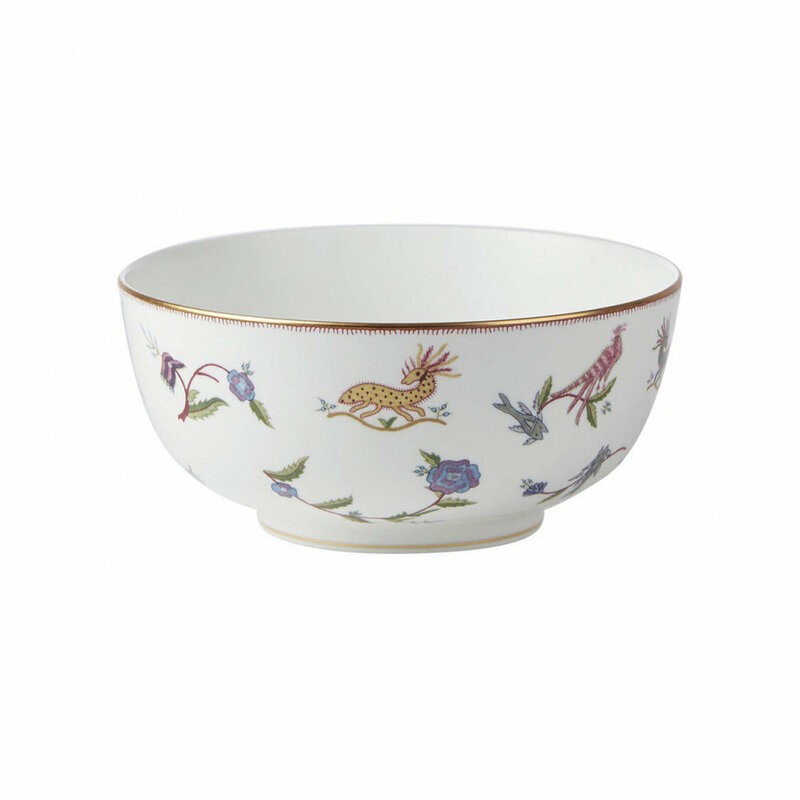 The intriguing, quirky set of motifs seem to me the perfect match for all parties involved—Kemp's eclectic, even somewhat eccentric, illustrative style, and the charming British simplicity embraced by both collaborator companies came together to create product lines that feel both imbued with a sense of history and a distinctly modern freshness. 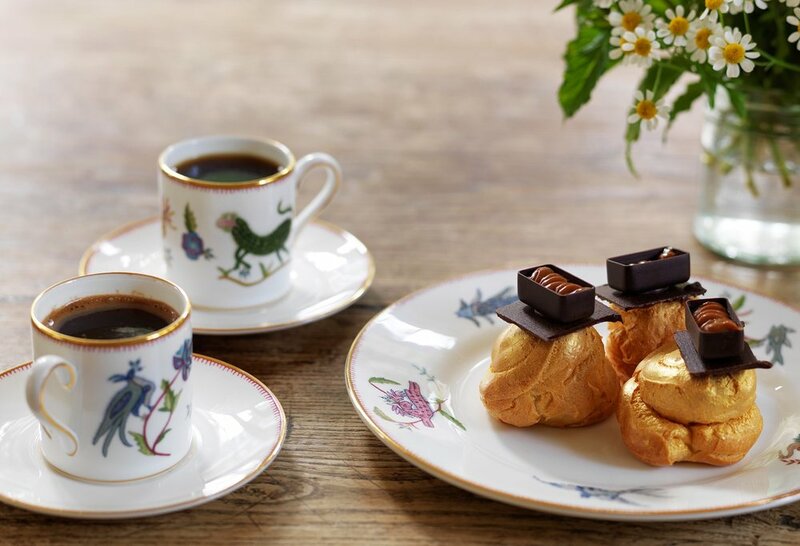 Combining the whimsical artwork that evokes traditionally folkloric surface designs with the elegant sophistication of upscale execution brings the best of both worlds to the table. And of course, both product lines make excellent use of themselves in Kemp's own hotels! Kemp's hand embroidered fabric for Chelsea Textiles. On right, Kemp used the fabric to upholster the headboard in one of her hotel room schemes. Tea service at Firmdale Hotels.